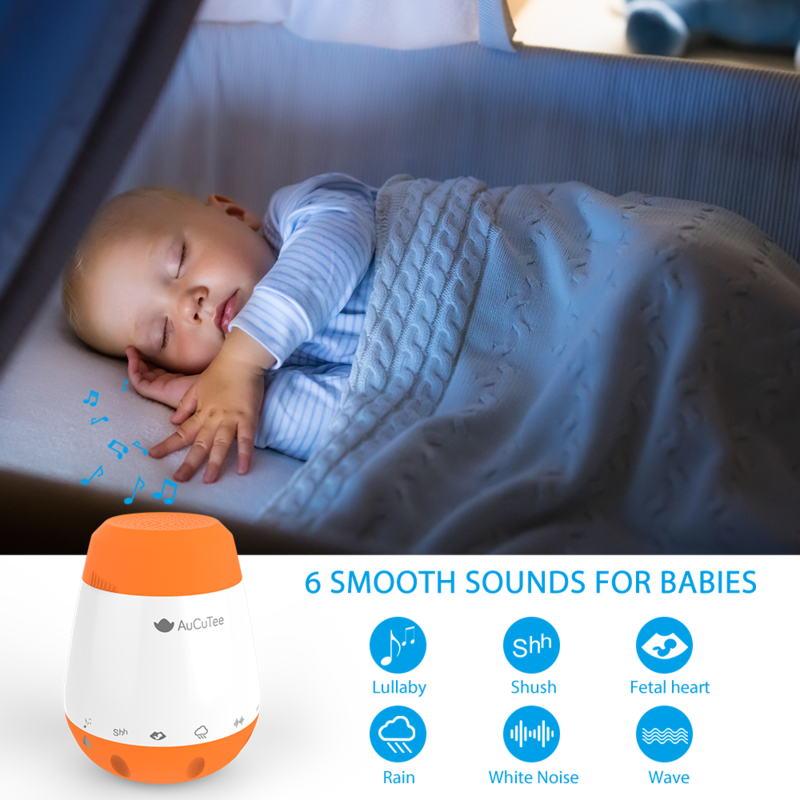 » Will a Baby Sleep Soother work on older children? Poor sleepers, I empathise. Some nights I couldn’t fall asleep if you paid me. So I tried a baby sleep soother to see if it help both me and the kids drift off. Sleep is so important for all aspects of health; it’s when your body regenerates and repairs, and without enough sleep everything will function less efficiently, from concentration to mood to immunity and fat loss. Sleep soothers come in many guises, from fluffy toys with a battery ‘noise’ inside to CD’s and phone apps to plug-in machines. 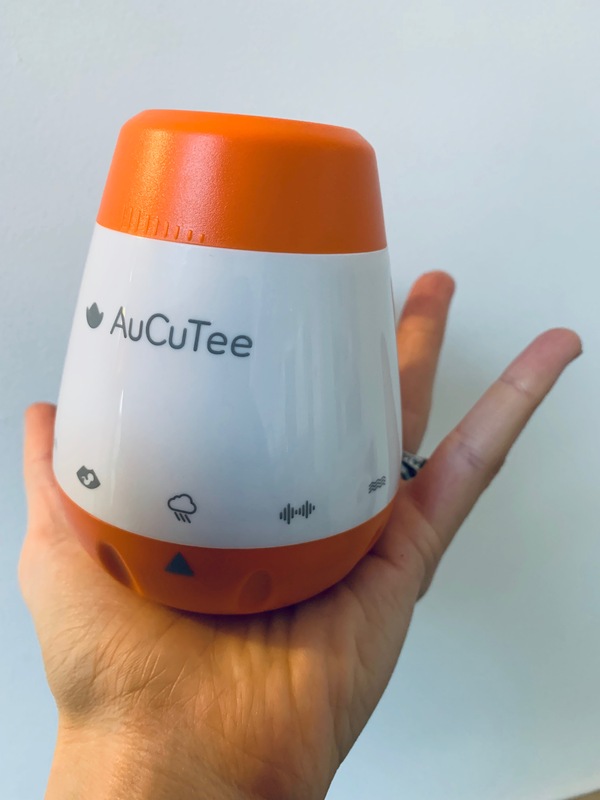 The AuCuTee Smart Baby Sleep Soother is a small portable device that’s rechargeable, and emits various white noises to help you (or baby, or the kids…) drift off. White noise is that continuous low noise like an air conditioning machine or waves lapping on the shore, and it helps the brain to switch off enabling you to fall asleep. It can drown out annoying noise like snoring spouses, barking dogs, traffic sounds, airplane tinnitus, passing trains, and noisy neighbours! It’s also small enough to put in a pram or take with you in the car. Founder Allen was introduced to a white noise machine and loved how effective it was in helping him drift off to sleep, but wasn’t keen on the bulky, fiddly design. So he set about creating his own that was safe, small and super simple to operate. The bottom section of the soother can be twisted to point to the sound you want. The sounds switch off automatically after 30 minutes, but are reactivated upon noise, so if someone stirs enough or wakes, the sound starts again. The long-life internal battery is rechargeable via a cord that fits most phone chargers so there’s no wires while it’s in use, but if you’re using it for a baby or small child the soother is made of ‘chew safe’ materials in case they get hold of it! Volume and power switch are adjusted by twisting the top orange section, and there’s no fiddly nobs or buttons to get confused over or for babies to fiddle with. My girls are 6 and 9 and aren’t terrible sleepers but they’re overthinkers and worriers, so if there’s things on their mind, they’ll always come out at bedtime. 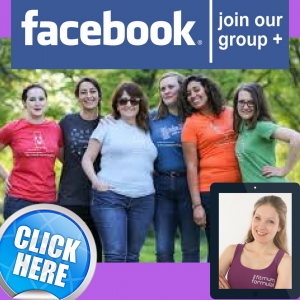 School problems, friendship squabbles, it will stay hidden until I turn out the light and….’Mummy this happened today…….’. So anything that helps their brain switch off after they’ve offloaded what’s bothering them can only be a good thing. They figured out that of they put the soother on loud in the corridor they could both hear it from their respective bedrooms at the same time, and chose the Lullaby tune. Presumably this is because logically they associate that as a bedtime tune and have yet to experience random white noise (e.g. swooshing waves) as an effective sleep aid. They loved it, and the only trouble I had was the next day when I tried to find it to take a photo for this blog but spent 45 minutes hunting for it, only to find it in the dolly crib. Obviously. The next night it was my turn and I chose ’Wave’, recalling the serenity when I slept under the stars in Turkey to the sounds of the ocean just a minute’s walk away from our villa balcony. I didn’t get to hear much of it….I was asleep within minutes….. 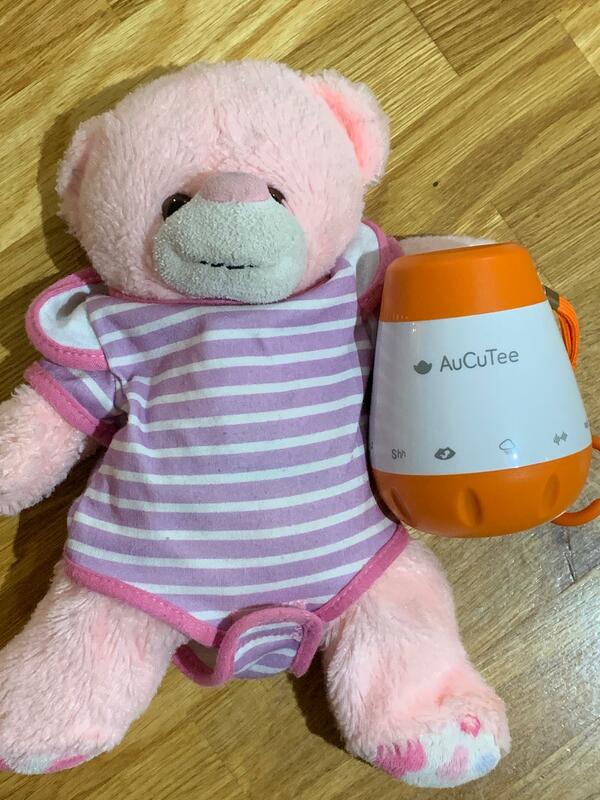 The AuCuTee Baby Sleep Soother can be found for less than £25 on amazon here, or there’s more details about other white noise machines (some designed more for adults too) on the website here, and there’s a 12 month warranty.